On 3 December 2012, St. James’s Palace announced that the Duchess was expecting the couple’s first child. At less than 12 weeks, the announcement was made earlier in the pregnancy than is traditional due to her admission to hospital with acute morning sickness. The Duchess was admitted to St. Mary’s Hospital, London, in the early stages of labour on the morning of 22 July 2013. 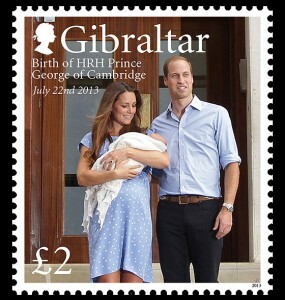 It was announced that the Duchess had given birth to a boy at 16:24 BST (15:24 UTC) on 22 July, and that the baby weighed 8Кpounds 6Кounces (3.80Кkg). The Duke was by his wife’s side when she gave birth, and he is expected to take the full two weeks’ paternity leave from his job as an RAF search and rescue pilot, allowed by the Ministry of Defence. The birth took place in the Lindo Wing of St. Mary’s Hospital – the same hospital in which Prince William and his brother, Prince Harry, were born to Diana, Princess of Wales, in 1982 and 1984, respectively. The Queen’s former gynaecologist, Marcus Setchell, delivered the baby assisted by Guy Thorpe-Beeston, Sunit Godambe and Physician to the Queen John Cunningham. The customary formal bulletin announcing the royal birth was displayed on an easel outside Buckingham Palace, although in a break with tradition the news was first conveyed in a press release from Palace officials. Gun salutes signalled the birth in Bermuda, London, New Zealand, and Canada; the bells of Westminster Abbey and many other churches were rung; and iconic landmarks throughout the Commonwealth realms were illuminated in various colours, mostly blue to signify the birth of a boy. In Gibraltar with the permission of the Royal Household, a Notice of Birth (the same one as is hanging outside Buckingham Palace) was attached to the front gate of The Convent (the official residence of the Governor of Gibraltar since 1728). With the Rock as the backdrop, members of the Royal Gibraltar Regiment carried out a 21 gun salute to signal the birth. The birth means that three generations of direct heirs to the throne are alive at the same time, a situation which last occurred between 1894 and 1901, in the last seven years of the reign of Queen Victoria. On 24 July, the day after the Duke and Duchess appeared outside the hospital to allow the gathered press to see the baby; the Prince’s name was announced as George Alexander Louis.